Nicely furnished large (about 800 SF) one bedroom unit with both king and queen beds on a beautiful river gorge with nearby waterfall and swimming pond. Unit has kitchen, private patio, shared sauna, cable TV, DVR and Wi-Fi. 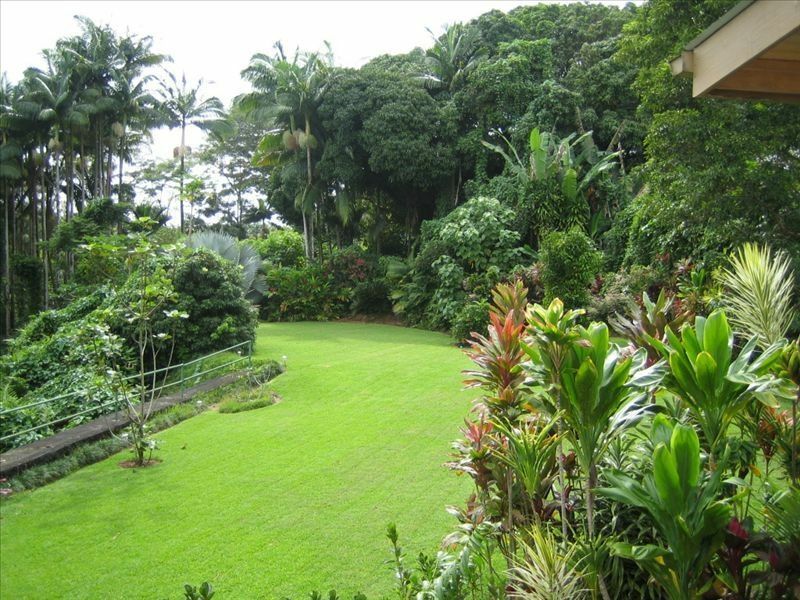 Lush quiet surroundings, yet only 5 minutes to downtown Hilo. All windows look out at beautiful large, landscaped yard - like having your own private tropical rain forest. Parking available (one car) and optional breakfast (fresh fruit, local foods, kona coffee) can be arranged. We also have a second suite, (a studio apartment with a queen bed) available, that can also be seen on VRBO (#363493) or at Homeaway (#294283). For more details, map and much more information on things to see and do in the area, etc., please see our web site and blog, OurHiloHome. Location: A couple blocks off of Mamelahoa Highway in Papaikou, between 6 & 7 mile markers. 1. Take highway 19 (Mamalahoa Hwy) north out of Hilo. 2. Landmarks you will pass include the ‘humming bridge’ and the Alae Japanese cemetery. 5. Then keep following the narrow road (VERY SLOWLY please, 10-15 MPH on our little private road, the neighbors will greatly appreciate it, thanks!) until get to row of mailboxes on right and our cream colored, white metal roofed home(s) on your left. 7. Continue on the gravel/dirt road, 100 feet or so past the mailboxes around the little bend to the second of the two connected homes, on your left. 2. Landmarks you will pass include Onomea Bay scenic drive and Pinkie’s store (big pink pig). Follow directions from 4-7 above. Keywords: Private 1 Bedroom, 1 Bath separate mother-in-law apartment on own floor of large home. Sleeps 4. There's a deluxe full studio (#363493) unit above the one bedroom unit that is available to rent as well. For much more information, directions, etc. for both available units, please see our web site and blog found at the bottom of this page. Two dads, biologist and ESL teacher, with two beautiful girls. We bought our little piece of paradise to spend much of our summers and dream of living there full-time one day. Originally from Virginia and Utah, currently living in San Francisco primarily, but have lived in DC, NY, Germany, Sweden, Korea, Thailand & Nigeria, so welcome guests from all over the world. Besides the home with all its beautiful woods, we fell in love with the very convenient, yet peaceful location and the beautiful, lush surroundings and yard. Its location on a stream with waterfall and swim ponds is a bit of heaven for us and a perfect escape from city living for us, our kids and our guests. Yet only a 5 minute, beautiful drive to downtown Hilo, its many ethnic restaurants, shops, museums, etc. And even closer to nice beaches, great botanical garden and scenic drives. 1 full bath, with tub/shower combination. There's also a cold water outdoor shower in the backyard, if desired (good for rinsing off after a swim in the stream). You can walk or bike there.Closest beach at the end of the road where Pinkie's store is (store now closed), it's the next road past the 7 mile marker (past the turn off to get to our home). Wonderful massage therapist lives upstairs, so appointments can be easily arranged for our guests!